Last night Karl and I attempted to watch a movie. Afterwards we lied in bed and laughed at ourselves. It appears that we are virtually incapable of having a proper movie night. Last movie we watched together? Maybe one this summer at his parents' house? Not sure. And if we did then I was either on the computer half the time or stretching on the floor. Either way it's been a long time. This weekend we are house-sitting down here in Phoenix and have access to Netflix. 220 movies available to us. You'd think we could fine one we like and that's worth our time.Well, it only took me about 23 minutes to find one I was sort of interested in: Nordwand. (North Face.) It probably doesn't come as a surprise that it was a German movie. Good thing Karl speaks German... It was a good movie. I was a little hesitant at first because it plays during the time of Hitler. I have seen more than my fair share of WW2 related movies and I am not interested in any more. But this one was different and I liked it. 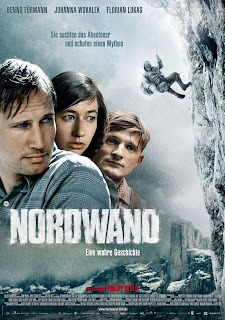 About half-way through the movie when the guys are making their attempt to climb the Eiger Nordwand, Karl (who had been doing research about the movie on his computer most of the time) proclaims: All 4 of them are going to die! Great. Thanks, dude! Why watch the movie if we know none of them are going to make it? That seemed rather pointless, so we skimmed through some of the scenes and then turned it off. This was it! This was the movie I really wanted to see! Only, we didn't have the movie. But then I found it in little sections on YouTube. Only, by now it was like 11pm and who starts a movie at 11pm? Oh. Wait. There are probably lots of people that do but they are not us. But - what the heck - it was Thanksgiving and I was going to watch that movie! Karl thought I was kidding but I most certainly wasn't. So I put him to bed and went back on the couch. but never finished it - until today. Needless to say we haven't attempted to watch any other movies since then. Karl's parents tried when we were visiting them but they didn't have much luck either. But if you have any suggestions that might meet our, aehm, high standards, don't hesitate to pass them along! PPS: After finishing this post, I had to watch Barfuss again. Even though it wasn't Thanksgiving. It was just as good as the first time I saw it.